Todd Perry is the Club Coach at Rostrevor Tennis Club. The Todd Perry Tennis Academy works closely with the Rostrevor Tennis Club to promote playing competitive tennis at Junior and/or Senior level. Rostrevor Tennis Club caters for tennis players of all ages and ability, and has excellent club facilities at Jenkins Ave, Rostrevor. Rostrevor Tennis Club competes in the Eastern Districts Tennis Association against other clubs from the area. 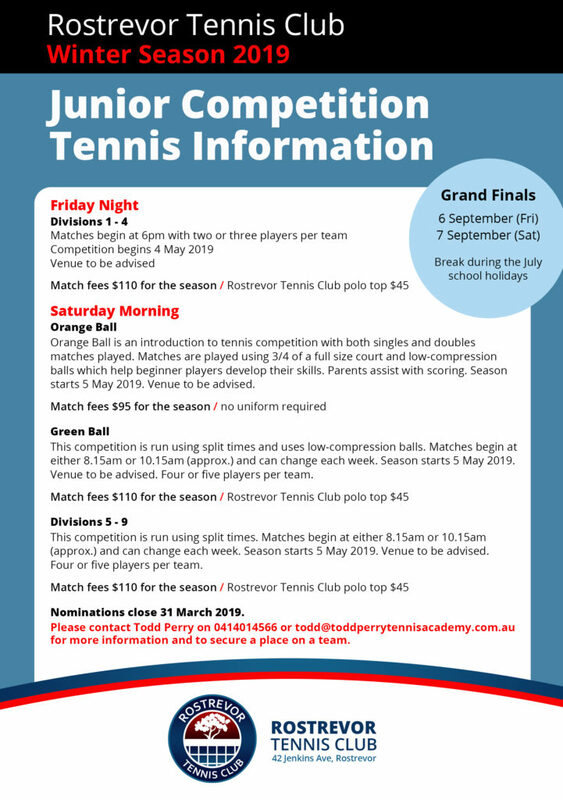 Rostrevor Tennis Club enters teams in both summer and winter seasons. Junior team nominations are OPEN now so please contact Todd Perry if your child would like to join a team for the 2019 winter season.